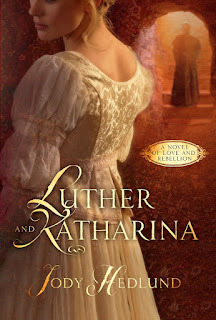 I was given an opportunity to review Luther and Katharina : A Novel of Love and Rebellion, by Jody Hedlund and I accepted out of curiosity sake. It being a fictional retelling of the meeting and marriage of Protestant Reformer Martin Luther and Katharina von Bora, a former nun, I wanted to know how Hedlund would handle the topic. I was raised learning about the Reformation of the church and am fairly familiar with Luther and his bride's story but it's always interesting to hear someone else's take on a topic you feel connected with somehow or another. 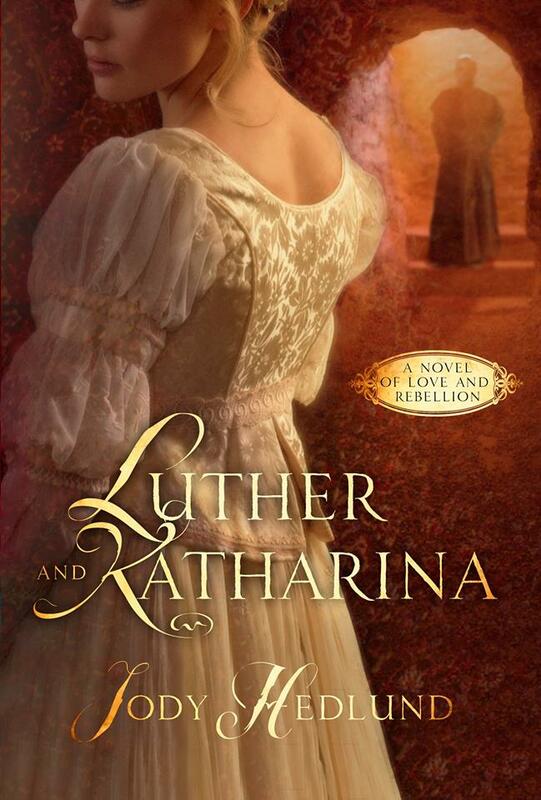 Luther and Katharina is basically a piece of Christian historical fiction. I'd never read a book by Jody Hedlund before and so I have nothing to compare it to. My regular readers know that the Christian fiction genre is not my favorite because I find most Christian writers to be rather unskilled in the art of storytelling, generally speaking. As far as Hedlund's ability to tell a story goes, I can't say that I harbor any complaints. I found the story interesting from start to finish in the sense that I was captivated by her story. I never felt jarred out of the tale by a poorly crafted phrase, which is my usual complaint against the modern Christian author. (Ann Voskamp seems to have convinced everyone that a high percentage of adjectives exalts both writer and reader to an an almost ethereal state of being.) I appreciated Hedlund's more direct and practical approach in her style of communication. 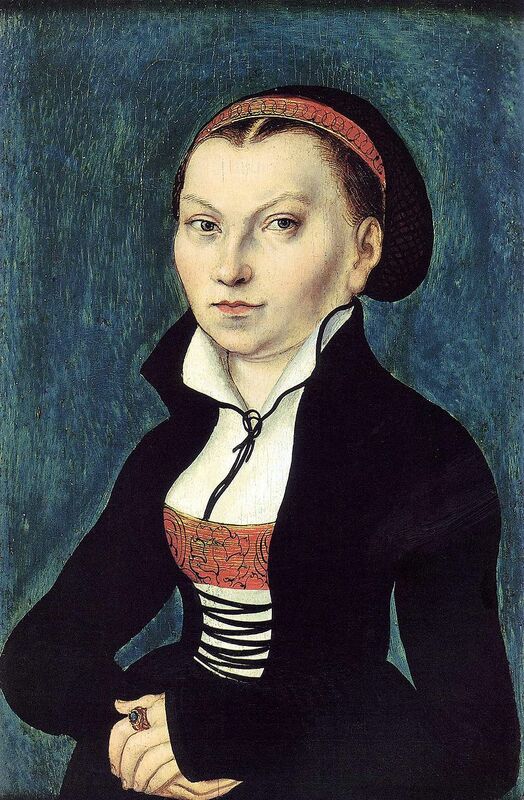 The story opens with Katharina's escape from the nunnery where she had been raised. She and several other nuns had read the writings of one Martin Luther, who preached a Gospel that had not hitherto been heard. Part of his new teachings included the idea that that marriage was designed by God and ought to be entered into, not avoided for piety sake. As a result of his writings on marriage, many monks and nuns began leaving their cloistered lives. In the case of the nuns, they frequently found themselves abandoned by family and without means of supporting themselves and so many were married off in order to care for husbands and build families of their own. Katharina von Bora was one of the final nuns in her "group" to remain unmarried. Eventually, of course, Luther marries her himself and they had a very happy marriage. Theirs is a rather unique love story and interesting to hear. Hedlund uses facts in her story whenever she finds them available to her. However, there are plenty of unknowns in the story of Martin and Katharina and to fill in the blanks Hedlund used her imagination to explain what their relationship might have looked like and how it came to be. As I say, there are gaps which Hedlund fills, but she also went above and beyond and created scenes and incidents which are fancies of her own imagination and with these moments I took issue. Where the history books leave out the hot and heavy interactions between these two famous love birds, Hedlund leaves much less to the reader's imagination. This habit of hers in wanting to create passion on the page is ultimately what leaves me feeling rather hesitant in recommending the book to others. My chief complaint is that aspects of romantic relationships which absolutely can be left to the reader's imagination were spelled out in greater detail than I think necessary. If you don't agree with me, and think that including a more gritty picture of romance is an acceptable practice, I'd point to Jane Austen and suggest that less is more. How many females do you know who absolutely love the relationship between, say, Mr. Darcy and Elizabeth Bennett? We know what ultimately happens: they get married and probably they kiss a lot. (Heh.) We are so thoroughly satisfied with their relationship without needing to know anything more and I would say that's not just Austen being subtle but that is an artist's skill. Austen tells us all we need to know and we are happy. Hedlund (and others in modern novels) must think we wouldn't be able to figure out and be satisfied with the idea of love unless we "see" it played out in tiny details. With me, such authors assume incorrectly. I can be very happy that Martin and Katharina eventually got together without needing the sultry details. Why do publishers and authors feel the need to say more? What is the purpose behind being so descriptive and so racy? I tend to think that shows a lack of skill in writing when the author falls prey to the desire to express the seductive aspects of the story. I can't in good conscience tell anyone now that Luther and Katharina makes for clean reading. But I'm still left with the question of "Why?" Tell me a meaningful story for I would love to hear one. Use historical character because I think that's fun. Label it Christian fiction and I'm going to hold you to a higher standard as an artist than I would a non-Christian. Christians should not be prudish but we should absolutely think on what is good, right, true and beneficial. When I ask myself how beneficial it was for me to read the love making scenes I conclude that it was not beneficial or necessary to the story one iota. You can argue that "facts are facts" and if a writer is telling a true story, straight narrative, with some sketchy, dark, or horrific parts I'm not inclined to mind that so much because they are communicating something which actually happened in history and is (I trust) essential to understand. I don't think we should ignore historical facts out of some sense of prudishness. However, I am opposed to gratuitous violence and romantic descriptions when they are simply not necessary. Yes, Martin and Katharina had a romantic relationship but I don't need to know about their first night together for a multitude of reasons, chief being that it's not a necessary component to understanding the story. It's gratuitous. Hedlund made it up. The publisher included it. Why? I suggest that it is not for the sake of a good story. Yes, my opinion is growing harsher by each "Christian fiction" book I read. If you want me to quit complaining about unnecessary scenes then leave them out. This was all unfortunate in my opinion because Hedlund has skill a story teller and I liked her style with the huge exception of an overactive imagination in the romance department. I did not feel that was suitable to the story itself or the genre it is published under. Personally I find the story of Martin Luther and Katharina von Bora quite fascinating. I think history is best understood when it's told in story form and so I'm completely in support of any attempts a person would make to bring to life the Luthers and their unique relationship and how it affected the world. It's a fascinating story which is why I was enthusiastic to read this book. In the end though, I can't think of a single person I could hand this book to and say, "Read it. You'll love it!" I think most of my reading friends would take exception to this title for the same reasons I did. Which is a pity. I know I don't necessarily sound grateful here, but I do appreciate having read this book because I wanted to be familiar with it and know what it was about. While my hopes for loving it and being able to recommend it were dashed, this does not in any way effect my appreciation for the opportunity I had to read it. Many thanks to WaterBrook Press who sent a copy of the above title my direction in order to facilitate this review. I received no additional compensation and if you do not believe that all of the above opinions are 100% my own then I don't know what else to say here. How unfortunate. I've seen a very sad trend towards more and more explicitness in Christian fiction lately - and it's meant that I (who actually did enjoy Christian fiction as escape reading) have pretty much abandoned the genre. Interesting. I appreciate honest reviews rather than a glance over. Thank you. That's too bad. I haven't read Hedlund's books but I follow an author's blog she is a part of. She recently posted about the odd custom of "witnessing" the marriage night consummation in the middle ages here: http://inspiredbylifeandfiction.com/the-strangest-tradition-of-all-witnessing-a-marriage-consummation/ That is one among many reasons I am glad I do not live in those times! But it sounds like she went beyond incorporating the custom to giving us an unneeded imaginative description. I am dismayed by this trend in some (it's not in all) Christian fiction and try to speak out against it when I have opportunity. Thank you for this review. I have not read this book, nor will I. As a single girl, I've realized I have to be extra careful with stuff like this. I kind of expect to have to occasionally lay aside a "secular" novel or skip over sections, but you would think Christians would realize we're supposed to be different. Sad that this is becoming a problem. Too bad about the book, but I was most struck by your parenthetical comment on style: "Ann Voskamp seems to have convinced everyone that a high percentage of adjectives exalts both writer and reader to an an almost ethereal state of being." I thought I was the only one who found her style a little or a lot too flowery for my taste. I don't comment often but wanted to thank you for sharing what you read. You are my go to girl for deciding whether to read a book or not. Really wish there was a Common Sense Media type website for adult books! I was so excited when I heard about this book, since I'm Lutheran. I was even going to recommend it to my book club, but I'm glad I read your review first! I think I'll probably still read it myself, but nix the book club idea. :) Thanks for your thoughts!